I have become so addicted to my crockpot lately that I have decided to add a new page to my blog, titled "What a Crock!" Here, I will have links to all my crockpot recipes and I would like some of your recipes, too! 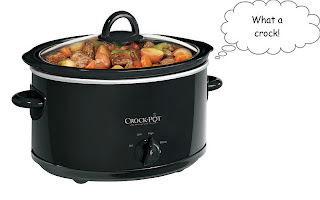 If you have a post with a great crockpot recipe send me the link and I will place it on my page-along with the title of your blog so you get the credit. You can leave a comment here with your link OR you can send me an e-mail at Macy@craftyconfessions.com. I can't wait to see what you've got cooking! I know how you feel! My crockpot is becoming my best friend! I'll send you a couple recipes that I've recently used that got rave reviews. This is a genius idea! I will be checking back often!! lol! I love the crock pot! I created it by accident one day and, I swear, it's the best pot roast EVER. Can't wait to see your recipes. I posted a great three bean crock pot chili recipe just today! Feel free to use it! I would be honored! Thank you for sharing your wonderful recipes, I love them all. I can't wait to read your crockpot recipes! For a busy mom like myself, I don't have enough time to cook a meal on stove.